Wikipedia defines a paleo-channel as "a remnant of an inactive river or stream channel that has been filled or buried by younger sediment. The sediments that the ancient channel is cut into or buried by can be unconsolidated, semi-consolidated, consolidated or lithified." Fascinating work by the McDonald Institute for Archaeological Research, University of Cambridge has looked at these remnants in the northwest of India, helping to understand on a fundamental level the ancient Indus agricultural environment, so much of which has changed in four thousand years. Above: Figure 4. 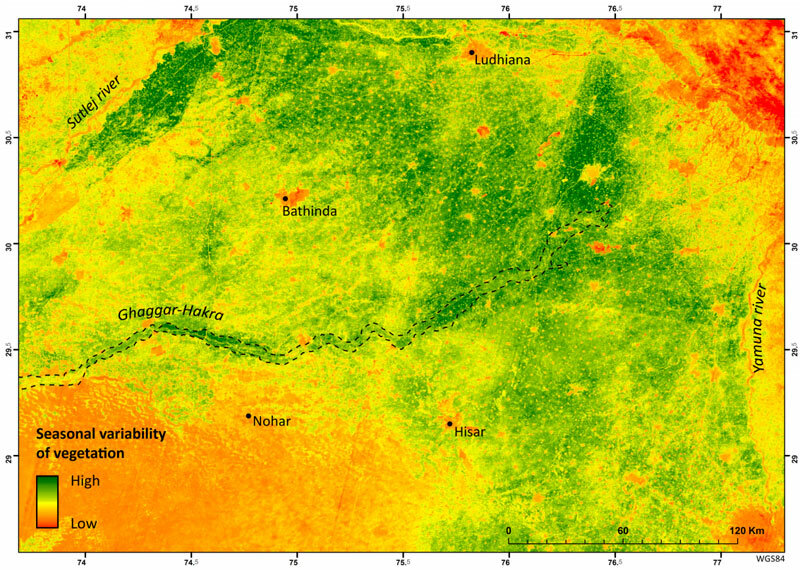 Normalised Difference Vegetation Seasonality Index (NDVSI) of the study area where the greenest areas indicate a higher seasonal variation of vegetation. Ghaggar-Hakra palaeo-channel has been highlighted with a dashed line.